Todd Wilkowski founded Performance Physical Therapy in 2002, after working for four years at a startup multi-disciplinary pain management center in New York City. A Buffalo, N.Y. native who earned a bachelor’s degree in physical therapy from Ithaca College in 1993, Wilkowski had already spent several years working in Cincinnati, a hub of orthopedics and sports medicine at the time. 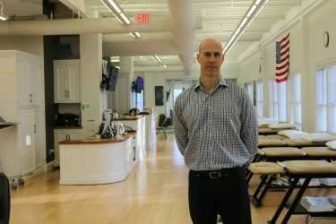 He founded Performance after purchasing the physical therapy practice from the Manhattan startup, and expanded to Greenwich in 2005. Today, Performance employs 90 people between a New York City location and four more in Fairfield County. On Monday, Wilkowski launches Performance’s sixth office on Cross Street in New Canaan. “We have seen a lot of New Canaan residents through the years, it’s a great community, and we decided it was a good time to explore the New Canaan market and see if it would work out to have a facility right in town, instead of asking people to travel to come to us,” Wilkowski said on a recent afternoon. In fact, Performance trainers have been serving a broad base of New Canaan clients for years. With locations in Stamford, Greenwich, Darien and Westport, they’ve worked with New Canaan Youth Football teams, for example, and also bolstered the strength and conditioning program of New Canaan High School athletic trainers. Clients include not just young athletes presenting problems such as overuse or traumatic injuries from sports, but also 20- to 40-year-old “weekend warriors” who injure themselves trying to stay in shape and overdo it, and seniors, Wilkowski said. Services include PT and training as well as sports medicine, massage, pilates, cryotherapy and nutrition. Performance will be located at 16 Cross St. and has already joined the New Canaan Chamber of Commerce. Residents are familiar with the new mixed-use building, an anchor of the reimagined Cross-Vitti corridor that in 2014 was considered a contender to house the local post office, and last year featured an eco-friendly cleaners. Performance is moving into the entire street-facing commercial space. The 2,200-square-foot area will include an exercise studio and two treatment rooms, according to a building permit application filed in January. Asked about his own keys to success, Wilkowski said “sweating the details” has been important. Performance has developed its own set of “core values” and that’s one of them, printed on the business’s walls and T-shirts, he said.